The Eldon Trombone features a .495" bore designed for easy tone production and projection. This trombone also features a brass outer handslide and crook plus a chrome inner handslide for enhanced durability. Includes a mouthpiece and case. The ETB-100 displays a great design and reflects Etude's commitment to outstanding construction, resulting in an instrument that will give you years of musical enjoyment and give your student every chance to develop a lifelong association with the love of music. 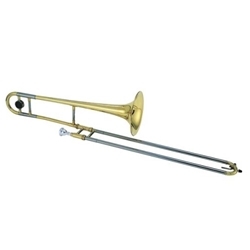 This Bb trombaone offers features usually found on more expensive instruments that include an attractive yellow brass body with clear lacquer finish and comes with a collegiate case.